Why are eReleases’ prices higher than PR Newswire (iReach)? PR Newswire owns a web-only press release service (iReach) in addition to its newswire direct to journalist service. And yes, iReach prices start at $129, but, like PRWeb service, this is web-only publication. What is the difference between eReleases and its web based competitors like XYZ Web, etc.? 1. email submission directly to subscribing journalists. 2. posting on websites, making available to search engines and social media. 3. distribution on a major newswire of press releases, which is by far the most important of the three. It’s important to understand the 80/20 Rule (also known as the Pareto Principle or the vital few vs. the trivial many) — basically this is the observation that everything in life is distributed unequally. For example, a minority of a company’s customers are responsible for the majority of revenue. It’s the same with press release distribution. While there’s nothing wrong with posting a press release on websites, and nothing wrong with emailing subscribing journalists directly, the great majority of the effectiveness of our press release distribution is contributed by the newswire. When the goal is to reach journalists, the newswire distribution, by itself, is significantly more effective than both the emailing and website posting combined. Most of eReleases’ competitors do NOT issue press releases over a newswire of press releases. While they may say that they send their releases to the Associated Press, Reuters, or UPI, it is important to note these are not traditional newswires of press releases but newswires designed to send licensed content they’ve written to participating newspapers. This is a critical difference that many competitors use to mislead customers into believing they will receive traditional press release newswire distribution when they will not. A true newswire of press releases will run your press release over a mechanism that is being fed to newsrooms across the country. This mechanism includes dedicated terminals that stream newsfeeds, special feeds on a corporate intranet, as well as private newsrooms on the Internet for journalists who are working remotely. eReleases issues press releases over PR Newswire, which is the oldest and largest newswire of press releases in the country. Most Fortune 1000 companies and nearly all publicly traded companies use a major newswire of press releases because they recognize that is the most legitimate and widespread mechanism for reaching the media. With eReleases, that is what you get. There are a few competitors that promote that they are going over a major newswire of press releases like Business Wire or PR Newswire — but the few who do are generally paying a small fee for your press release to go only to a local city or small region of the country — so you are not getting a comprehensive distribution in those cases. You are given a link to your press release on that newswire and wrongly assume that you received a widespread distribution to newsrooms across the country. Another thing that cheaper competitors have done is co-opt the word newswire. They simply claim that they are a newswire, and when questioned, they point out that they have put their press releases on a web-based newsfeed and have a place on their website where journalists can sign up to receive press releases. This is not a newswire. Journalists are busy and are not going to go hunting from site to site looking for news. If they do go to a website, they’ll go to the largest site that has the most press releases, as well as a reputation for publishing the most newsworthy press releases. Journalists are going to go to PR Newswire first. That’s just a fact. Could some journalists trickle down and go to a minor press release website? Sure, but the likelihood of that is very small, and as a result, your exposure to the media is substantially less. Think of search engines. Theoretically, if you don’t find what you’re looking for on Google, could you then go to Yahoo! or Bing? Sure, but those instances are going to be very few and only attempted by the smallest number of people. Often people feel like their press release is not that newsworthy, so it’s not worth spending a lot of money to go over a major newswire, but with eReleases you don’t have to spend that much money to leverage newswire distribution. In addition, what you may not realize is that almost every trade publication, and every industry blogger, is going to cover their industries by using and reviewing a major newswire like PR Newswire. Even if you think you are only going to get picked up within your own industry, and such pickup is critical coverage, then having your press release issued over PR Newswire is even more important, because that’s where people will pick you up whether it is breaking news, or just an update of your product or service. Do you have a comparison of your different press release distribution options and prices? Yes! click here to view eReleases’ three press release distribution services compared to each other. I see you’re a PR Newswire partner. Why do the major newswires, including Business Wire, charge more for national distribution than you? What am I missing by going with you? While we are a PR Newswire partner, we are not simply a reseller. eReleases features a robust distribution of its own. We are designed to provide a comprehensive national U.S. distribution of your press release through our Buzz Builder™, Newsmaker™ and PR Pro™ services, which also happens to include PR Newswire. You will receive email access to subscribing journalists through eReleases that you would not otherwise receive through another service. You will also receive a PRTrue List™ distribution that you can only obtain through eReleases’ top-tier offering, PR Pro™. In addition, through our Newsmaker™ and PR Pro™ plans, you will receive extra words. All of the major newswires begin charging extra at 400 words. We can also provide local targeting or regional saturation as well. The reason we’re able to offer the PR Newswire distribution is because our client base is made up of thousands of small businesses, most of which don’t have access to, or a strong understanding of, press release newswires. This fact allows eReleases to act as sort of a press release cooperative for small and some mid-sized businesses. And because of our volume, we were able to negotiate a substantial discount with the newswire. That discount is passed along to our customers through our more affordable prices. We guarantee your press release will be distributed. For all of our clients, this includes a WireWatch™ report with links to the press release posted on as many as 300 media websites (see WireWatch™ for details). We guarantee a minimum of 60 media websites will post the press release for our Buzz Builder™ clients, a minimum of 90 media sites for Newsmaker™ clients, and a minimum of 120 media websites for our PR Pro™ clients. For sub-$1,000, we cannot promise you will receive additional media coverage. The fact is that it’s difficult to receive press as so many online and offline organizations and businesses are competing for the spotlight. Do you guarantee that I will get media coverage? eReleases guarantees that your release will be distributed through the oldest, largest, most well-respected newswire for press releases in North America — PR Newswire. We’ll provide you a complimentary report as proof. Because media members themselves are the arbiters of what is considered newsworthy for their readership, eReleases cannot guarantee media coverage. Remember that even PR firms commanding $15,000 monthly retainers are unable to guarantee media placement. Click here to view client reviews. Not everyone has great success but those who do always seem eager to share their results. We love to hear of your experience whether good or bad. It helps us gauge what works and who benefits most from our press release services. Can I do a free test run? Unfortunately, our newswire partner, PR Newswire, which charges nearly $1000 to issue a 500-word press release, charges us for every press release we issue. While we would love to issue a free press release for you and show you how great our service is, we just cannot absorb the cost required to do so. Do you offer special rates for new customers? First-time customers can purchase 1, 3 or 6 Newsmaker distribution credits for a significantly reduced rate through this order form: https://order.ereleases.com/special-welcome-to-ereleases-promotion/. Do you have a monthly or yearly subscription service? To make PR easier for our clients, eReleases allows credits to be purchased on an as-needed basis. Orders for single press releases or bundle packs of distribution credits are purchased via our secure online order form. Typically, services offering unlimited releases are not paying any newswire, much less a top-tier newswire like PR Newswire, per press release like we are. eReleases does offer one program in which payment is made monthly: The Personal Publicist Program. How is word count calculated in my press release? The headline, dateline (including city / state), boilerplate, and media contact information all count towards the final word count. If it is content that is being distributed as part of your press release, it is included in the word count. We believe having any more than five links in the average 500 word press release runs the risk of interfering with readability and may be viewed by search engines as a possible red flag. We believe you should list your url (offset in parantheses) after your first company mention in a press release, as well as in the boiler plate (“About Company” section) of your press release and perhaps in the contact information. You can certainly include links to particular products or services when mentioned as well as any files you may want to highlight. You can also include anchor text, also known as link label or link text, in which you have a keyword or keyword phrase that links to a webpage. Some of the newswire’s partner websites will respect these links, but some won’t. Please note that we believe it is best practice to include the actual url, and omit anchored text. Anchored text within press releases can trigger Google’s updated Link Schemes Document, which considers anchored text to be unnatural. Keep in mind that we tag all links, anchored or not, as “no follow”. Regardless of the type of link that you choose to include, these links will not be indexed by search engines. We stand behind Google in affirming that press release issuances should not affect SEO. Can I embed videos, pictures, or sound files in my press release? Images and a video may be included either as simple links within the press release, or they can be embedded in the body of the release. You may include up to two images which will be linked by the newswire within the body of your press release. Also, you can place any type of link within your press release, including links to videos, pictures, PDFs, and other types of multimedia files. You may also choose to have up to two images or a single video embedded within the body of your press release. You will upload the image and/or provide us with the link to a video during the ordering process, and these multimedia files will be embedded into your press release. 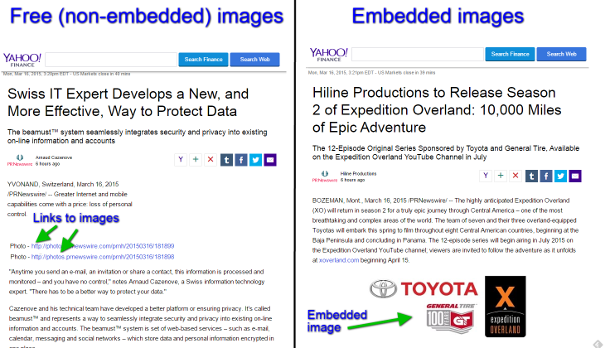 The embedded multimedia file will be viewable on hundreds of websites (for images, over 2000 partner websites support embedding, and for videos, over 700 partner sites support embedding). The total number that pick up your release will vary depending on industry and subject matter. The newswire has it’s own very specific formatting requirements. There are formatting issues with both the newswire as well as the newswire’s partner websites that accept and re-publish these press releases. Therefore, we must send the press release in a format that is acceptable to the newswire. We recommend that you include links after the first mention of your company, and in the “about” or boilerplate section of your press release, as well as with the press contact. And if you mention specific products or services where a direct link to an internal page on your website would be advantageous, we recommend including such a link there. Anything more runs the risk of appearing unnatural and may alienate journalists and search engines alike. It’s just a matter of finding the right balance. But to summarize, there is no limit to the number of links you may have in your press release. What purpose does a press release serve? The purpose of a press release is to make media members aware of your news in hopes that they will turn it into a news story and thus spread the word to their readers: the public. Press releases can be effective marketing tools in that they allow clients to control the message being transmitted to the media, and by extension, the public at large. What is the best day/time to issue a press release? There is no magic day for issuing a press release. The reason for that is this: if there was a “best” day, it would quickly become the worst day, because insiders would tell their friends and colleagues, and more press releases would be published on that day, increasing competition for journalists’ attention. For example, if Tuesday was the “magic day” in the industry, every publicist would soon learn that, and you’d see a huge spike in volume on that day, which would overwhelm journalists, making Tuesday the most competitive day to issue press releases. You find a lot of publicly-traded companies as well as the U.S. government issuing bad news after 5PM on Friday. But guess what? Every Monday morning, those stories are right there on the front pages, so they’re not fooling anybody. Journalists are paying attention every day of the week. At eReleases, we issue press releases Monday through Friday, because we find that most journalists are working a Monday through Friday schedule. Therefore, it’s most efficient to work on a Monday through Friday basis. On the weekends and overnight, you’re dealing with a skeleton crew of media, and they’re going to be hyper-responsive to very important news and leave all other news for the regular shift. Our clients’ news, for the most part, is not breaking news. In short, there is no magic day to issue your press release. Regarding time of distribution, eReleases schedules its press releases for morning distribution. We have no facts to justify our position but we believe it makes sense to have your news in the inbox of subscribing journalists when they sit down for that first cup of coffee in the morning. A press release that is newsworthy is what works, and then only some of the time. Announcing that you’ve put your cyber-shingle out on the web very rarely cuts it unless your services are unlike anything else on the Internet. However, it is worth taking a chance … and for good reason. The client appearing in Bride and named “Female Entrepreneur of the Year” by Minorities In Business magazine announced her gift shop through our service. On the surface, you wouldn’t expect this press release to be that successful. However, a busy editor under deadline who needs an anecdote or wants to humanize a story will turn to good examples he’s recently seen, sometimes regardless of your press release’s newsworthiness. Being in the right place at the right time happens a lot in the world of PR. Any additional press release writing and distribution advice? Where are your press releases? Many of our clients don’t follow up and place the text of their press release on their website (and it does belong on your website, not on our website or another company’s site). Not only are you losing opportunities among your customers who may want to know more about your company and services (read “credibility” here), you are losing media opportunities. Say you have three press releases on your site and an editor who received the most recent one visits your site for more information (not all editors will call — in fact, most don’t). Some facts and additional news gleaned from those previous releases can be just what that editor needed to tip the scales in your favor. Even if you only have one press release, start a press room or media kit for your website. At the very least, the additional text will be welcome for search engine spidering — making it a little easier for customers and media to find you. Also, be sure to read our advice on how to write a press release, as well as advice on how to send a press release if you decide to distribute it yourself. How many places does my press release go? As the only reseller of PR Newswire’s national distribution, eReleases places your press release in front of 85,000 registered journalists constantly trawling the wire for newsworthy items to share with their readers. Your release will also reach a general media audience representing more than 30,000 top media outlets across the US. Finally, your release will be sent to each contact listed on the target category(ies) of your choice. The number of target category contacts depends on the specific lists chosen, but most lists contain at least 500 – 1500 industry-relevant contacts. View the media outlets that eReleases reaches here. How does eReleases’ distribution compare with PR Newswire US1? There are less than a dozen, small local media that eReleases doesn’t reach through our custom national distribution. But in actuality we greatly exceed PR Newswire’s US1 reach when you include the email we send to our own list(s) of subscribing journalists. Additionally, for our New Customer and PR Pro packages, your release is sent to our PRTrue lists, which are hand-crafted, hyper-targeted media lists from one of the largest and most reputable journalist databases. Click here to view eReleases’ three press release distribution plans and pricing. You may also select additional services like immediate distribution and extra target categories, which are priced at $100 each. We also offer press release writing services for an additional fee. How do I order a press release distribution? What time will my press release be distributed? All press releases are scheduled before 9:00am US Eastern Time unless same-day distribution is requested. eReleases has identified this distribution time window as the optimal one for attracting media attention. Morning distribution allows media members to receive releases via email while they are most receptive to considering story ideas for the day — before the market opens. Can you handle rush orders? What are your scheduling policies? Does this affect editorial review? We process most orders on a next work day basis. Press release orders which we receive during one work day are scheduled for distribution on the next work day, unless you select a later distribution date. We schedule all normally timed press release orders for distribution prior to 9AM (US Eastern time). You may order rush distribution (same day as your order), with an added fee of $100. Rush orders received during our office hours are aimed for distribution within 2 hours of receiving your order (4 hours if image or video embedding options are selected). Rush orders placed when our office is closed are aimed for distribution before 10AM (12 Noon if image or video embedding options are selected). For full editorial review, please submit your distribution order prior to 6PM (US Eastern time) on the work day prior to your desired distribution date. Orders submitted outside of this limit, including rush distribution orders, will receive a limited editorial review due to the time constraints. How are your press releases sent? Your press release is sent via email with the text formatted by us for line length and presentation. The text of the press release is sent within the body of the email message as many organizations will not accept attachments because of virus and security concerns. You may include up to two images in your press release, which you will normally upload during the ordering process. No HTML will be placed within the emailed press release. The subject of the email message sent to editors will include your press release title or an abbreviated version of it. Your press release is also issued through PR Newswire, which is a traditional newswire service. PR Newswire sends press releases to more than 22,000 newsrooms, 90,000 journalists through its media websites, and 1.4 million equities terminals. Can I schedule my press release for a specific time? While you can schedule the date of distribution, you are not able to select a specific time for distribution. Press releases are normally scheduled before 9am Eastern Time in aggregate (no specific time). Our low price is based on standardized treatment of press releases. Because there are lots of moving parts, having a press release scheduled for a specific time creates an additional burden on our editors and creates opportunities for mistakes. What is your Associated Press (AP) Newswire distribution? All of our press release services feature Associated Press (AP) Newswire distribution. This includes distribution of your press release to top US newspapers and media outlets — The New York Times, Los Angeles Times, Chicago Tribune, Philadelphia Inquirer, and Dallas Morning News — through the Associated Press (AP). AP webfeeds are accessible to more than 30,000 journalists at more than 1,300 U.S. newspapers. Is your press release distribution global? Our distribution is focused on the United States. We distribute the press release over the newswire and to our media contacts in the United States. International Distribution can be added to any standard US distribution at a rate of $200 per country or $1000 for global. When sending a press release internationally, it is important to understand that the numbers game is not going to result in more media response. Most international services are incredibly expensive and simply pad their distributions with contacts that have no interest in your company or organization. 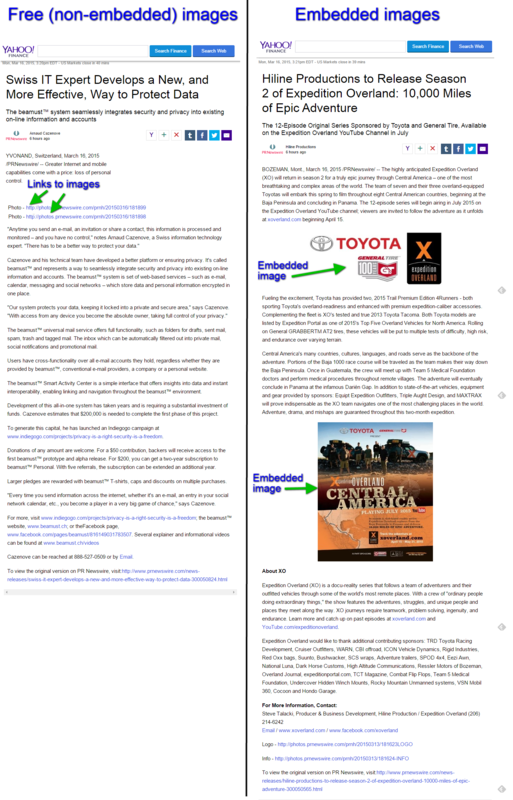 The eReleases International Distribution is centered around affordable Direct-to-Journalist targeting. eReleases will take your press release and design an international distribution that specifically targets only those international journalists who have an immediate need for your news based upon their subject specialty and publishing history. Keep in mind that we target only English-Speaking outlets. Depending on your specific target categories, we may be able to expand your distribution if you provide a translated version of your release. Because we utilize direct-to-journalists distributions, international distribution will not be reflected in your WireWatch Report™. Additional Countries available on per-release basis. How do I redeem my press release credit? Redeem your credit(s) using these easy 1-2-3 instructions. Step 1 – click Login or Order. Step 2 – Log in using the form under the header area. Step 3 – Once logged in, you will see a list of any credit(s) you have available. Click on the Use Credit link to redeem your credit. We have a press release scheduled for distribution and we see there is some inaccurate information. Can you please correct the error for the release? How can I find out who wrote about us? We send you a WireWatch™ report shortly after distribution providing you with as many as 200 links to where you can view your press release live on the Internet. These are sites that stream much of PR Newswire’s press releases, including News Alert, MarketWatch, Yahoo!, BizJournals.com, and Google. Do you think a major newspaper or broadcaster will do a story on me after my first press release? While extremely unlikely, it is not impossible. Every day, we see newspapers, major and minor outlets, pick an obscure company to mention in an article. Many of these companies are plucked out of obscurity because they’ve issued a press release and appeared on a particular journalist’s radar. In those cases, it’s often more a case of luck in which a press release appeared at a time when a journalist was looking for a person, product, or company to incorporate into a story. The key is that it does happen. If you look at the testimonials section on our website, you can view the amazing success that many of our clients have had. One thing you may notice is that in most cases, it’s not their first press release that generated success. In many cases it might be their second, third or sixth press release that catapulted them out of obscurity. In most cases, their press releases are NOT breaking news. These are people who are issuing the same type of news that you probably have around you, and they are doing the same types of business activities that you are doing, which could be incorporated into a press release and get you in front of the media. These are the media opportunities that our customers are getting but you are not because you are not issuing press releases to the media. How do I know that the target media received my release? Can I have a WireWatch™ report that reflects my target selections? Rest assured that we are delivering your press release to the media in your target category selections. This is why we disclose the outlets in each list here. Each outlet on each list represents a real editor, reporter or journalist looking for a lead on the next great thing. Every morning, our team custom-builds the list of recipients for each release and deploys a campaign in which the intended recipients receive a specific press release via email. This campaign takes place simultaneously with the newswire distribution. This is what targeting is all about. The hits you see on your WireWatch™ report, which is delivered to all of our customers, are really instant gratification: Your release is out in the world, and here it is on major sites. Targeting, however, yields slower results because you’re dealing with the human factor. A live, breathing person is essentially making a judgment on your release — and doing it on his or her own time. Moreover, these members of the media are often operating offline in print or broadcast outlets not visible to Google and driven by long lead-times. Any given press release may not resonate with any given targeted contact at any given time. But if it does, the reward can be phenomenal. In addition, you may find some value in a clipping service like those described at https://ereleases.com/clipping-services/. What can I expect when I use your press release services? One client asked if he could expect between a 3-5% publishing rate. We said he would be extremely lucky to receive between three and five articles written as a result of his press release distribution. Two of our most successful clients averaged between two and four articles each press release submission. However, those articles were in the Washington Post, The Economist, Bride, and Minorities In Business magazine. In fact, the client appearing in Minorities In Business magazine was also named “Female Entrepreneur of the Year.” This doesn’t happen with everyone. But it does happen. And it can dramatically change a business when it does occur. For guaranteed publishing rates, expect to pay a PR firm at least $6,000 a month — and they tend to work on a tier system. That $6,000 will be directed at receiving press on the trade magazine/source level. For an additional amount, they will then move up to traditional sources such as newspapers. Again, these PR firms earn that money. It is not easy getting media coverage. But if you are on a budget, it makes sense, at the very least, to submit press releases on a regular basis. A single press release is less likely to result in press than a monthly press release or, at the very minimum, a press release sent each quarter. Viewing each press release as part of an ongoing media campaign is the best way to remain focused and to eventually receive media coverage for your company. My first release did not meet my expectations. Why should I continue with a second or third? If your goal is to get PR for your company, and to look at press releases as a way to market your company, you simply cannot judge a PR campaign on one or two press releases. No PR firm is going to sign a contract and issue one or two press releases, because they know that is not a PR campaign. A PR campaign is a series of press releases to the media in which you use different approaches, different hooks, to engage the media. Doing this, you will eventually have success. If you were to dedicate yourself to between six and ten well-written press releases with an assortment of hooks and angles for your company, you WILL receive media coverage, and that media coverage WILL exceed your press release costs by at least a factor of ten. If you are committed to it, and you are doing it right, you WILL get media coverage. We have never seen an instance where it hasn’t happened. If you are having difficulty, you need to have a no-cost discussion with one of our editors about varying your approach, including different hooks and angles. There are lots of opportunities for press releases to work but it is also easy to be lulled into a one-dimensional approach to PR in which you believe you’re trying something new but you’re really not. It only takes between one and three influential places to pick up your press release to make a huge difference for your company, including trade publications, a writeup on a specialized website, or an influential blog. We are not talking about a situation where you’re getting 40 or 50 stories about your company. You can achieve major PR success with just a few quality pickups. If your news is not out there, you’re not going to make it. If you’re judging PR on a single press release, we don’t want to take your money in the first place. Because in all likelihood, it’s not going to be business-transformative for you. We’d rather see someone commit to doing four press releases over the next year to see if it’s going to work for them. And even that is a little bit short-sighted. We’ve just never seen an instance where PR can’t be effective for a business that sticks to a formula of issuing a series of press releases with varied hooks. If you visit the Customer Success Stories on our website here, you can view the experience of fellow business owners. In nearly all cases, their press releases were not breaking news. How did they do it? In one word: persistence. How many people have read my release, and how do I track impressions? At eReleases, we issue your press release by emailing it to subscribing journalists, moving it over the Associated Press (AP) Newswire, and distributing it over PR Newswire, which transmits your press release through newswire terminals in newsrooms across the country, as well as places it onto participating partners’ media websites. For that reason, it’s near impossible to measure the impressions of your press release. There are web-only press release sites, like PRWeb, that do provide you with impressions, because for the most part, your press release resides on only one website. What happens is that they have other sites and partner sites that stream the headline and link back to the actual press release. Your press release is never moving out there to other people; it’s being made available on one page on one website, and that makes it very easy to measure impressions … but not so great for getting media coverage. Because eReleases is actually sending the press release out to individuals and pushing it to lots of journalists, we just can’t measure impressions. It’s not just the emails that go to subscribing journalists, it’s the newswire distribution. The newswire environment just doesn’t have the capability of measuring impressions on other websites, or email open rates. In the WireWatch™ report, you will be provided with various view counts, which represent the views of your press release as hosted on the PR Newswire site. Please note, however, that these statistics do not include the views that occur on the hundreds of other sites on which your release is published. Can you make me #1 on Google for a search for my company name or keywords? The great thing about press releases is that lots of people see a temporary increase in visibility on the search engines just because of the fact that your company or product name is mentioned in a press release that’s out there on a lot of different websites. However, this effect is ephemeral. News sites don’t list stuff permanently. You’re going to drift back downward anyway. If you get any SEO benefit from press releases, and we know a lot of customers who swear by it, we think it should be viewed only as a temporary side effect or bonus. It should NOT be the reason for doing press releases. The goal for press releases should be to get that media coverage, and to stay committed to the process of engaging the media with varying types of press releases. We believe that the SEO game is just that. If press releases were a magic wand in which you achieved long-term rankings, Google would change their algorithm. Google is smart, and we think that rather than “gaming the search engines,” you should simply issue great content, make sure you put those press releases on your own website, because they are keyword-rich, with a lot of great content, and you are the author, but we wouldn’t waste any time chasing press release services that promote that they can have you rank on page one of Google, because you will generally see that happen for your company and product/service name anyway. A company that touts that they’ll get you on the front page of Google isn’t a real press release company; they are an SEO voodoo company, and that’s another red flag indicating that’s not a company that you want to work with. How do you perform SEO on press releases? SEO isn’t something that you should be performing on your press release. What you should be doing is writing something for the end-users of the press release, which is journalists, possibly bloggers in your industry. By doing that you will have your important keywords in your release in a natural progression. If there are acronyms or buzzwords in your industry, you may want to initially mention the full name a bit more. One of the things that we find ourselves doing when we write about press releases is that we use the word “release” instead of “press release” or “news release” — so one of the things that we are conscious of is to go back and edit our copy and use the full phrases a few times in the copy. And that’s it; that’s all you should focus on. What we do at eReleases is to optimize press releases for search engines. We take care of the title tags, H1 tags, meta descriptions, and other things to make sure that the search engines can discover the release, but we don’t do any “black hat” or deceptive SEO stuff in an attempt to influence the search engines. The moment that you do that, you are likely violating the terms of service of the search engines. So we just make sure that it is coded in a way that is easy for the search engines to read and understand. When it comes to writing the press release, we don’t think you should even focus on the search engines, other than going back and briefly reviewing your keywords and making sure that they appear in a natural way. If you find that your keywords are appearing too often, you should go back and omit some of them, so that it doesn’t appear as though you are “keyword-stuffing” your press release, which will result in search engines ignoring or penalizing your content.